Skinceuticals Daily Moisture Review: Does It Deliver Results? Skinceuticals Daily Moisture: Does This Product Deliver Results? Skinceuticals DAILY MOISTURE, US $62 for 60 ml, is committed to significantly boost the moisture levels of normal to oily skin types without unnecessarily making the skin surface greasy. This product is designed to deliver a lightweight, oil-free formulation that will not leave your skin greasy. It significantly increases the moisture content of your skin and keeps your skin well-hydrated over a long period of time. It delivers sugars and amino acids to your skin which your skin can hold and lock in better than pure water. This product facilitates faster skin treatment and healing. This product’s formula will help control oil production. This product is formulated and distributed by Skinceuticals, a US-based skin care company that was first formed by a team of researchers once involved in skin cancer research. Sodium Hyaluronate: Adds to the natural hyaluronic acid produced by the skin, and acts like a moisture magnet that attracts moisture from the surroundings to sit on your skin, as your skin gradually releases these to keep your skin surface well hydrated over long periods of time. Pure Vitamin E: Moisturizes your skin, facilitates skin healing and rebuilds your skin’s protective outer layers. Algae Extracts: Boost your skin’s moisture levels by flooding it with sugars and amino acids, and enhance skin nourishment with minerals from the sea. Ginger Extract: Has natural astringent properties that tighten your pores, smoothens your skin, and lightens your overall complexion. Witch Hazel Extract: Regulates oil production, and facilitates faster skin healing from damage and aids in skin turnover. Use Skinceuticals DAILY MOISTURE must be incorporated into your morning and nighttime skin care routines. Dab a small amount on your skin and spread product evenly across your face, neck and chest. This product contains the highly moisturizing sodium hyaluronate, one of the most effective emollients added to skin care products. The product formula is designed to deliver lasting moisture using amino acids and sugar which tend to stay longer on your skin and therefore keeps it hydrated for longer. This is a multifunctional product that is formulated specially to address moisture concerns for normal to oily skin. This product contains parabens which have been proven many times to affect the normal functioning of hormones and the organs that these control. This product is formulated with phenoxyethanol, a toxic substance known to affect the healthy and normal functioning of the brain and the nervous system. PEGs, toxic chemicals that easily become contaminated with carcinogens, are included in this product’s formula. This product contains retinol and butylene glycol, both are well-known to be highly irritating ingredients. 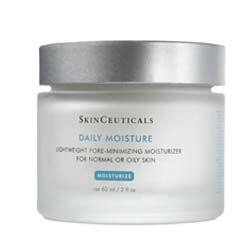 Skinceuticals DAILY MOISTURE will have been a helpful moisturizer specially catering to the hydration requirements of people with excessively oily skin. Unfortunately, the benefits come with a trade off with highly irritating and toxic ingredients in the formulation. Trust that there are other, better formulated products that won’t ask you to trade your skin health for vanity.